Main Power Extension Lead 3m, 3x1.5mm2, IP20, non-waterproof, white, Brennenstuhl, 1168430 White, single extension power cord from plastic Brennenstuhl with 1x earthed schuko plug and 1x socket. 3 meters cable length (H05VV-F 3G1.5) and child protection. Suitable for connecting and extending the reach on any appliances or office equipment. For indoor use only IP20. RoSH compliant. Main Power Extension Lead, 3m, 3x1.5mm2, IP20, non-waterproof, black, Brennenstuhl, 1165430 Black, single extension power cord from plastic Brennenstuhl with 1x earthed schuko plug and 1x socket. 3 meters cable length (H05VV-F 3G1.5) and child protection. Suitable for connecting and extending the reach on any appliances or office equipment. For indoor use only IP20. 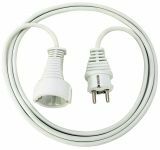 Main Power Extension Lead, 3m, 2x0.75mm2, IP20, non-waterproof, white, Brennenstuhl, 1161660 Universal, plastic extension cord Brennenstuhl with 3 meters cable lenght (H03VVH2-F 2x0,75) and 1x euro plug + 1x socket ( earthed, 2P+E). Flat main cable for connecting appliances with a max. of 2.5 A. With child protection. White color. For indoor use only IP20. Main Power Extension Lead 3m, 2x0.75mm2, IP20, non-waterproof, black, Brennenstuhl, 1161790 Universal, plastic extension cord Brennenstuhl with 3 meters cable lenght (H03VVH2-F 2x0,75) and 1x euro plug + 1x socket ( earthed, 2P+E). Flat main cable for connecting appliances with a max. of 2.5 A. With child protection. Black color. For indoor use only IP20. 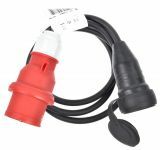 Main Power Extension Lead 5m, 2x0.75mm2, IP20, non-waterproof, white, Brennenstuhl, 1161670 Practical, multipurpose plastic power extension cord Brennenstuhl with 1x euro type (schuko) plug and 1x socket. Plastic insulation and 5 meters cable lenght. Cable type: H03VV H2-F. For indoor use IP20. Flat cable for connecting appliances with a max. of 2.5A. Child protection. RoSH compliant. 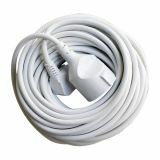 Extension cable, Brennenstuhl, 5m, 3x1.5mm2, IP20, non-waterproof, white, 1168440 Quality extension power cord (male/female) made of plastic with 5m cable length H05VV-F 3G1,5 in white color. With earthed and childproof plug and socket For normal use in dry conditions IP20. Warranty 12 months. Еxtension cable, Brennenstuhl, 5m, 3x1.5mm2, IP20, non-waterproof, black, 1165440 Quality extension power cord (male/female) made of plastic with 5m cable lenght H05VV-F 3G1,5 in black color. With earthed and childproof plug and socketFor normal use in dry conditions IP20. Safe box, Brennenstuhl, orange, waterproof for IP44 cable connections Safety box for cable connections as plug / contact from moisture. It is suitable for all types plugs and sockets. List Price 9.60лв. VAT Incl. 9.12лв. VAT Incl. Extension cable, Brennenstuhl, 10m, 3x1.5mm2, IP20, non-waterproof, white, 1168460 White Brennenstuhl mains power cord Quality, CEE 7/7 Plug, CEE 7/4 socket. This products is designed for normal use in dry conditions IP20. Extension cable, Brennenstuhl, rubber, 25m, 16A, 3х1.5mm2, IP44, waterproof, black, 1161470 Quality extension cable made of rubber from german brand Brennenstuhl. It is designed for short-term outdoor use but not extreme conditions. Protection degree is IP44. With extra robust earthed plug and socket. Max power of load 3600 W.
Adapter cable, Brennenstuhl, CEE plug 400 VAC / 16A 5Pin, 1.5m, IP44, waterproof, 1132960 Adapter plug to industrial plug CEE 400VAC / 16A 5Pin with cable length 1.5m and IP44 moisture and dust level. 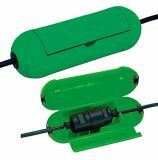 Safe-Box, Compound for protection of joints, Brennenstuhl, 16A, green Safe box which is used to protect connections of type - plug / socket from self-discharge, dirt and damage. Its large volume makes it ideal for all plugs and sockets. Extension Cord schuko 3x1mm2, length 10m Rubber extension cord PREMIUM with length 20 m designed for indoor use in dry conditions IP20. With earthed plug and socket. Max. allowable power is up to 2200W. Extension cable, PREMIUM, 20m, 3x1mm2, IP20, non-waterproof, orange Rubber extension cord PREMIUM with length 20 m designed for indoor use in dry conditions IP20. With earthed plug and socket. Max. allowable power is up to 2200W. Extension cable, LEXA, 20m, 3х1mm2, IP20, non-waterproof, white White extension cable from LEXA with cable leght of 20 m. Suitable for normal use in dry conditions IP20. 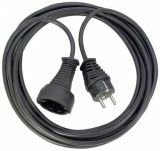 Main Power Extension Lead 15m, 3x1.5mm2, IP44, waterproof, black, BREMAXX®, Brennenstuhl, 1169890 Extension cord BREMAXX® from Brennenstuhl with 15 meters cable lenght (AT-N05V3V3-F 3G1,5), IP44 protection degree suitable for short-term outdoor use. Anti-freezing, highly flexible down to -35°C, oil and UV resistant, high mechanical loading capacity. With extra robust 1x earthed plug and 1x socket. Black color. Made in Germany. What is the extension used for? Extensions are gadgets that can carry and deliver electricity at a great distance. Typically, they consist of a plug, a cable and a contact socket. There are also extensions with more than one contact socket - they come under the definition of extension / coupler. Extensions are widely used in households as well as in industry. What extensions do you find in Vikiwat? In this category of Vikiwat's online store, you will find a wide range of high quality extenders with cable lengths of 3m, 5m, 10m, 15m, 20m, 25m. Vikiwat offer a cable cross section of 3x1mm2 for 10A consumption and 3x1.5mm2 for 16A. Extensions have plug and socket contacts. The exception is made by some models with a bipolar euro plug and a bipolar socket, respectively. In the model range, you'll also find waterproof IP44 protection extensions that are an excellent choice for outdoor or dust / damp environments. Exciters offered by Vikiwat are distinguished by excellent quality at an affordable price. Here you will find a wide selection of extensions of renowned brands like Brennenstuhl, Lexa, Premium and others. Which are the best-selling extensions? In case you need help in choosing an extension, you can always contact us and get a quick and competent answer to your questions. Vikiwat's team wishes you a nice shopping online!